I'm on a self-inflicted shopping ban at the moment, which doesn't have that much to do with my account's balance, but more with the fact that, as some of you may know, I'll be moving continents towards the end of June and settling permanently (or as permanently as it can be for me) in the evergreen state of Washington. I'm looking forward to the move, but not so much to packing my stuff into two suitcases! Hence the ban and, of course, a growing wishlist I'd like to share with you today. Interestingly enough, most of those products are unavailable here, but easily accessible in the States... In all honesty that might be the first reason I haven't got them yet. 1. LUSH Fresh Farmacy facial cleansing bar: I'm very much enjoying using my Sebamed facial bar, so I thought of trying a more natural version next. Thanks to calamine, chamomile, rose and tea tree oil it has a soothing and gently cleansing effect. It's supposed to smell like Dream Cream, which I've grown very fond of. 2. LUSH Tea Tree Water: I wanted to get it last time when I visited the other side of the pond, but finally decided against, and regretted it ever since. Contains tea tree, grapefruit and juniperberry water, whatever it is. 3. Jergens Glow Healthy Complexion Daily Facial Moisturizer: What a mouthful! This oil-free gradual self-tanner with SPF 20 seems to be a perfect 3 in 1 product: moisturizer, sunscreen and sunless tan. 4. China Glaze nail polishes: I'd love a nice, creamy pastel yellow shade like Happy Go Lucky, as well as some nice, bright corals and pinks for summer. Any recommendations? 5. The Body Shop bronzer in Shade 01: I've heard great things about this matte bronzing powder, it's described as a non orange, warm shade, and I think might compliment my skintone a bit better than Hoola, which at times I feel is a bit too yellow. 6. L'Oreal HIP cream liner in Midnight Blue: Love this color, I defo have a soft spot for navy blue eyeliners! 7. NYX powder blushers in Peach and Pinky: I use their Angel shade every other day, and this two colors really appeal to me, I'm especially curious to try Pinky, a super bright, cool toned fuschia pink, supposedly a dupe for NARS Desire or MAC Tippy from the Hello Kitty collection. 8. MAC Viva Glam Cyndi lipstick: I don't care for Gaga, but Cyndi, a reddish, buildable coral shade, screams my name. 9. Revlon Super Lustrous lipglosses in Coral Reef and Firecracker: I've neglected my lipgloss collection a bit in favor of lipsticks, and these two would be a very welcomed addition judging from the swatches I've seen. I'm not sure my wishlist really depends on the season, lol, but anyways, right now I'm into liquid highlighters. I'm thinking of getting one (or two?) from Rouge Bunny Rouge but that's really expensive stuff. 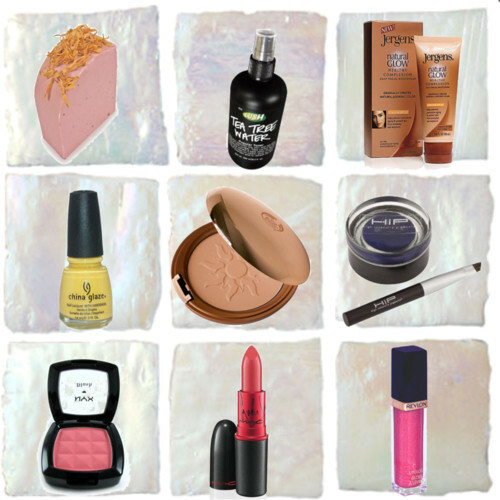 I have a lot of the same things on my wishlist :) I'm going to go look for the Revlon Coral Reef gloss later tonight, and I'm really wanting Viva Glam Cyndi as well! I'm loving anything coral lately. A word about the Jergens Glow Healthy Complexion Daily Facial Moisturizer, I bought this last summer and it smells HORRIBLE. My boyfriend wouldn't even kiss me while I was wearing it that's how awful and strong the scent is. Cyndi is GORGEOUS :) If you want a similar lipgloss which is still very pigmented, the Cremesheen Glasses are marvellous - there's one called Double Dare which matches Cyndi very nicely and is completely unsticky. I have a low stick-threshold with lipglosses and can't stand any of the Dazzleglasses, so I was surprised to find a completely unsticky gloss from MAC. And only TWO suitcases? are you serious? please tell me you're joking? I would actually get my stuff sent over in a massive package...I couldn't live without all my, well, STUFF. Sweetie, sorry I haven't been commenting for a while, busy busy busy life... Hope your move will go smoothly and will be as painless as only possible. Also I'd like to suggest something else for you to try as a face wash (although Lush does sound really nice). I've recently started using Liz Earl cleanse and polish facial wash (if you move to the US, they sell it there). I can honestly say it's the best cleanser I've tried in my life! And they don't pay me to say this. :))) I've been using it since January this year and can't get enough. My skin got super calm (it's very sensitive and dries quickly in areas) and looks very even. And if you prone to spot, I always say - check what you eat first, even keep a food & skin diary, sometimes you can discover that eating certain things brings out the spots or if you get them around your girly time, it's related to hormonal changes, but can still be controlled with diet and supplements. As my own wish list, I also had another colour for the nail varnish, something chocolatey, so I got it today, too. :) Plus I want a perfume (part of my birthday present :) ) and eyeshadows in peachy shade (Lancome used to have a beautiful one, but they don't do it anymore). And that's about it. @LittleRus: So glad to see you back, I'm hoping you'll have a bit more time to blog again! OPI sounds really nice too, actually I don't have any polish by them and would be tempted to try! Do you have any shade recommendations? I'm sure you're very right about the food I eat and the state of my skin, I'm planning on improving this aspect of my life as soon as I can control what I eat, as for now I have some limitations keeping me from it. best of luck on your move! what a big one it is...so this makes total sense that you don't want to haul over any more than you need. On my wishlist are all the nail varnishes in the world!